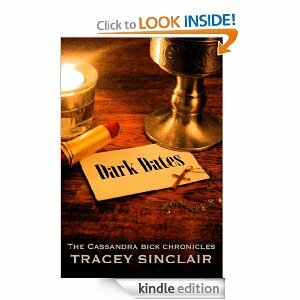 One of the things I have been blogging about recently is the sometimes arduous task of promoting my novel, Dark Dates. As I made the choice to self-publish (having been traditionally published before, albeit by a small press) I knew it would involve a lot of work, but I have been surprised by just how much it involves: researching marketing opportunities, contacting bloggers, writing guest posts and doing author interviews – at times it has felt like a job in itself! Review: Fangs for Fantasy – was delighted to get a 5 out of 5 review at this site, which provided me with my favourite quote so far – ‘Tracey Sinclair has turned me into a fan poodle’. I’m not entirely sure what it means, but I’ll take it. This is also a great example of how these reviews cross-sell for you – based on this review, the book got recommended as an interesting read over at Coffee, Cookies and Chili Peppers. Guest post: Rebeka Harrington – author and blogger Rebeka Harrington is very active on the cross-promotion front, and does an enormous amount of work promoting her Vampires Released series. I connected with her via Goodreads and we arranged to do guest posts on one another’s blogs (you can read mine here). I’d really recommend this, because it means that your guest is not only helping promote your book on their site, but they are invested in promoting your blog, too. I’ve already seen an increase in hits and Twitter followers off the back of several guest posts. Guest Post: Interview: A Book A Day – another cross-promotional opportunity, this time with author and blogger Tonya Cannariato, who reviews and writes for this site. We did author Q&As for one another: bringing new guests to my site (it was clear a lot of fans checked her interview out from the comments) while the interview she hosted for me got an awful lot of retweets. Reading Lark After Dark: Another interview, this time for the more ‘grown up’ arm of Reading Lark. Dark Dates by … me.